Yes, there are 2 bottles of Hershey syrup in my fridge. Why 2 bottles? ...why not? When I tell other photographers that I sold my $8,000 Canon 1Ds III for a wooden box, I am often met with confusion. My late Canon 1DsIII was among the best of the 35mm based digital cameras. Why on earth would I give up such a camera? It’s the look of film, and the warmth that it gives an image. I love the soft gradation of tone, the tangible sense of the grain, and the palette of subtle colors that are perceivable only to the most diligent eye. When viewed up close, a digital print can never match the warmth of analog film. I have nothing against Katy Perry, or other modern “digitally mastered” singers, but when you compare her songs to the rich, raspy voice of Ray Charles in his famous “Georgia on My Mind” — there is no comparison. This is the feel I get from film. If I was late in my career with a head full of gray hair, this past statement might come across as a “Get off my lawn!” moment. It still may be so, but I’m only in my (very) late twenties. Also, I’ll have you know that I don’t have a lawn — I have a wonderfully desert-scaped front yard. “Get off my crushed rock!” just doesn’t have the same appeal. Taking up large format film required a steep learning curve, but not where you might think. Operating a large format view camera is quite simple. The learning curve involved two major bumps along the road. Learning how to properly expose a photo using my Sekonic 558, was a process of trial and error. It took several months to become comfortable with easy exposures. More difficult exposures (dynamic scenes, extreme contrast, etc) took the greater part of two years to become familiar with. Now I am very confident in my metering ability. The second hurdle was understanding, and learning to work with a variety of different film types. The first film I tried was Fuji Velvia 50. It was by no accident that I chose this film to start with. It is favored by landscape photographers because of it’s high contrast, and brilliant saturation. Velvia 50 also happens to be one of the most difficult film emulsions to work with. Errors in exposure are greatly magnified, resulting in a photo that is horribly under, or overexposed. Also, exposures as short as 4 seconds require extra time due to reciprocity failure. In fact, Fuji doesn’t even recommend exposures that are metered longer than 1 minute. This is a major issue for us large format shooters. Even on a sunny day at mid-day, my 8×10 camera often requires 1 full second. Taking up large format on Velvia 50 was baptism by fire — a very colorful and contrasty fire. I now have 4 different film stocks within my rotation: Fuji Velvia 50, Fuji Velvia 100, Fuji Provia 100F & Kodak Ektar 100. With much trial and error, I have learned the strengths and weaknesses of each. Of the films I listed, one stands apart. Kodak Ektar 100 is a color negative film, whereas the Fuji films are all color slide film. The advantage of slide film is that you can easily see the results with a light table and a loupe. If the exposure is spot on, viewing a sheet of large format film on a light table is a magical experience. The photo has dimension and depth. The disadvantage of slide film is that there is a very limited range of tones. If your dark tones are a bit underexposed, this detail is gone forever. Color negative film is more difficult to evaluate with a loupe, but it’s exposure latitude is stunning. A high contrast scene is not a problem for color neg film. A well exposed sheet of color neg film will knock the socks of any digital capture. This leads to the heart of this post. Last November in Zion National Park, I shot a frame of Kodak Ektar along side Velvia 50 (or Velvia 100) for nearly every photo. This provided me with a (relatively) well controlled comparison between the most notorious slide film for landscapes, and a relative newcomer in the large format market. It was only last year that Kodak began producing Ektar 100 in 4×5 and 8×10. At $20 a click, it seems almost wasteful to shoot a sheet of 8×10 Ektar for every sheet of Fuji Velvia 50 on my Zion trip. As mentioned in my trip journal, I was hesitant to use Ektar as my primary film on that trip because of the lack of reciprocity failure data. Most of my shots would be in dark canyons, often times requiring exposures several minutes in length. Round one consists of a photo of a forest floor covered with freshly fallen maple leaves. The light source was a canopy of backlit leaves, combined with the glow of a towering sandstone cliff on the other side of the canyon. I scanned these two strips of 120 film with an Epson V700 scanner. No color adjustments were performed upon scanning. I merely set the levels to provide the best possible scan. The biggest difference is of course the color. 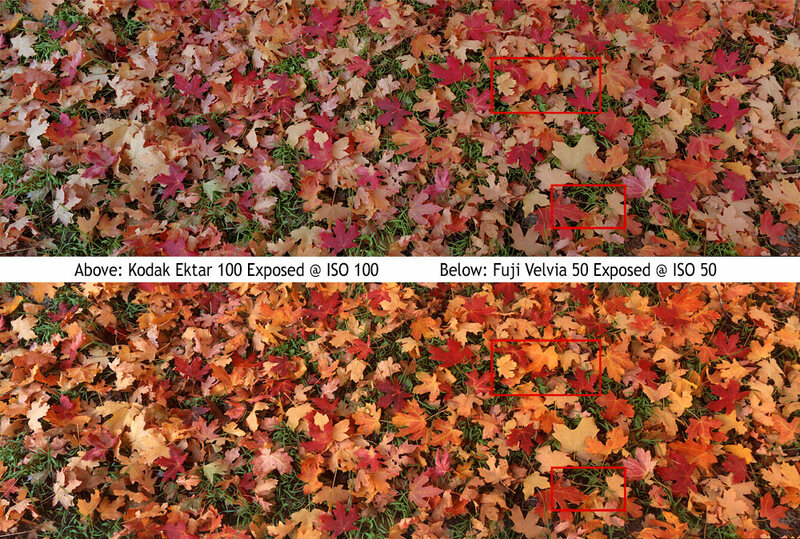 The Velvia 50 shot has a very warm tone, leading to potential gamut issues with the red leaves. Although the Ektar shot is far more subtle, it could be warmed up to match Velvia 50 if desired. Which is more accurate? Check out this frame grab from my Video Journal for Zion 2010 Day 5. The color in this video can’t be used as an ultimate truth since it too has been digitally processed. However, it does seem to match with my memory for the scene. Strictly from a color perspective, we can conclude that in warm reflected light, Velvia will exaggerate this color, and Ektar will be a bit on the cool side. I can easily tweak the Ektar shot to resemble Velvia if I chose to do so. Conversely, it would be difficult to bring the Velvia photo back to the realm of normalcy without losing depth. When viewed up close, the color difference is even more profound. We now focus our attention on individual leaves. Without a doubt, the Ektar shot looks more realistic. The Velvia shot looks like someone hit the “Nuke” button in Photoshop a couple dozen times. This should be no surprise, since we all know that Velvia 50 is a very saturated film. It is interesting to see a side by side comparison though. My next crop is designed to show the range of shadow detail contained in each film. Remember that this is just from my Epson V700 flatbed scanner. A drum scan will retrieve even more detail. Notice the dark area near the center of each crop. The Ektar 100 is definitely showing much more shadow detail. Also, look for the rock at the 5 o’clock position of my first 100% crop sample. Needless to say, I’m very impressed at the depth I’m able to get from this film. I have yet to drum scan any shots taken with it, but strictly from a color/tone/contrast perspective, I really like what I see. This example was in even light, and the exposures were relatively fast. No reciprocity failure correction was necessary. I exposed this shot at ISO 100 as directed. I bracketed my exposures for this scene in 1 stop increments (-1, 0, +1). In the end, I selected the ISO 100 shot as the best exposure. Although the difference in exposure was not significant, I recommend sticking with the rated ISO in these conditions. This entry was posted on May 23, 2011 at 9:21 pm and is filed under Equipment Reviews, Shooting Tips. You can follow any responses to this entry through the RSS 2.0 feed. You can leave a response, or trackback from your own site. nice intro review. Looking forward to reading your followup. Will you be addressing that Ektar reciprocity compensation issue? My next comparison is a very high contrast scene that required some reciprocity failure correction. I have somewhat solidified my opinion regarding the reciprocity failure on Ektar, but I still need to look over the film with a closer eye to be certain. With my next trip looming, it is important for me to learn more about this film. I bought a new box of Ektar 8×10, as well as some 8×10 Kodak Portra 160VC for this trip. Must say I’m a bit suprised by the “huge” difference in shadow-detail, but it kinda makes sense, but still, there is quite a bit more detail in the Ektar. Thanks, really like these comparisons. It was fun shooting them side by side, and I sure have a lot more respect for negative film. Although it’s amazing viewing a well exposed slide on a light table, I’m really digging color neg film. 1. Negatives (color or b&w) are ultimately information sources for prints. As such, they generally are capable of containing a huge amounts of information that NEEDS to be interpreted during the printing stage by the photographer. In that sense, evaluating things like color and contrast (both of which could easily be altered here to come very close to the Velvia rendering) proves less revealing than one may initially think. Negatives also require more from the photographer as the film is making far fewer rendering decisions for you. 2. Negatives generally require more exposure, since their latitude is so much greater. In your example (for example), if more exposure had been given, the black portions of the negative image could contain full detail and you still wouldn’t have blown the highlights. Expose for the shadows with negatives, and for the highlights with transparencies. 3. As your example shows, when conditions are favorable and you want the aesthetic of slide film, shoot slide film. 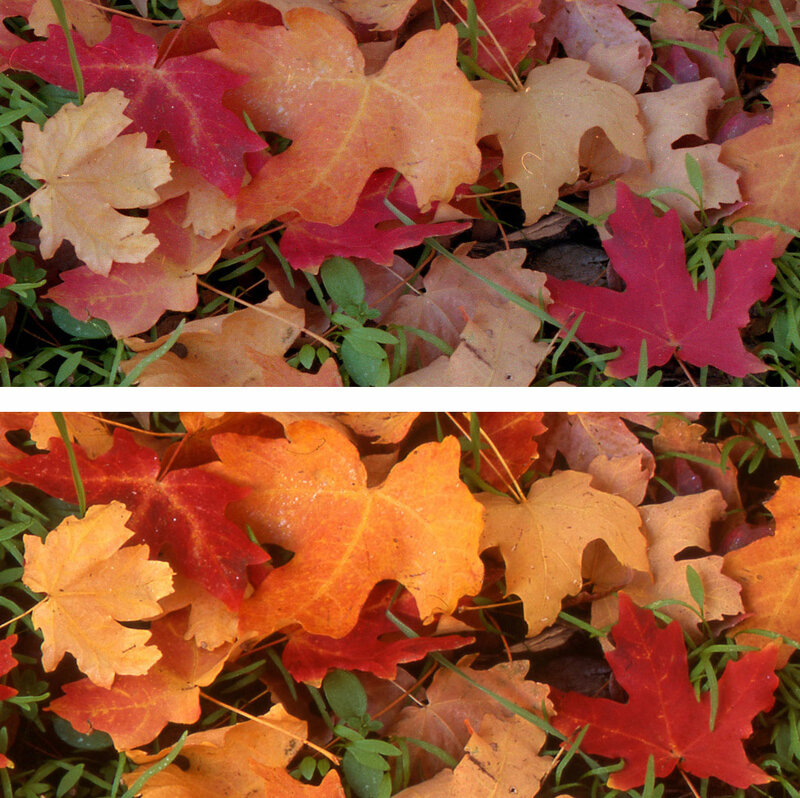 If you need more exposure latitude, use color neg. Their respective strengths are different and should be used appropriately for the desired image. Thanks for chiming in Joel. You’re definitely right about the need to interpret the massive amount of tonal detail that is present. It’s fun to have that degree of control though. I’m very use to slide film, and the need to “get it perfect” in camera. Interestingly enough, I shot the Ektar at ISO 50 as my primary exposure, but then bracketed at ISO 100 and ISO 200. I had heard that negative film needs extra exposure, just as you stated. I also read that you need to be careful with Ektar, because it has a tendency to blow the highlights. In some ways, it must be treated like slide film. When I scanned all three strips of film, I found that the ISO 50 shot was losing a bit of depth in the highlights — I can’t say they are blown, but they are more flat. In this situation, the ISO 100 result proved best in the context of my Epson V700 scanner. I wonder if the +1 shot would be better when drum scanned? In my next comparison, I compare Ektar with Velvia 100 in a contrasty, low light scene with a large range of tones. This is where my learning curve was with this film. I had no clue how much reciprocity failure correction to give for such a long exposure. As a bit of a giveaway, only one of the photos on my web gallery was shot with 8×10 Ektar. With your keen eye for print film, I’m sure you can spot it in a heartbeat. That photo will be the subject of round 2. Very interesting entry Ben. Just a quick question, what software did you use to scan the Ektar sample? Sometimes I use roll film in a 6×9 adapter on my 4×5 and usually have to scan it in Silverfast. There is a big difference in tone and colors between the basic Epson software (I like it a lot by the way for BW) and Silverfast for color negs. I haven’t had much luck with silverfast for negative scanning. Strangely enough, I found that the basic Epson software does a decent job. I may have to give silverfast another try, but I just couldn’t get anything decent from it. I must say that I haven’t had any Maine Maple syrup before, but I can only imagine how good it is. The stuff I have in my fridge is from our hat up north! Really enjoying your posts here. I am just barely getting into the water of 8×10 photography and your posts are a guiding light. Thanks so much! Thanks Tim! The 8×10 is a beast to shoot, but when everything turns out, it’s pure magic. It’s great to see others out there shooting this format. Extremely interesting! I just like landsacpe photography and these discussions give me a lot of insight. Hi Ben, what data are you using for reciprocity failure rate for the Ektar? Most people suggest experimentation. Also, in your video of the spot metering, you talked about measuring of tonality. Where do you find this info when it comes to the film? Is it more of an issue with slides, and not negative film? very good comparison. moving now to Ektar !!!! thank so sharing. obviously the Ektar is better in coulor rendition. well I recon you would come out like that every time if you under exposed the Ektar by 1/2 stop. I know that a color neg 100iso will almost NEVER amount to a 50iso slide film BUT the Ektar does seem to do well when exposed properly.